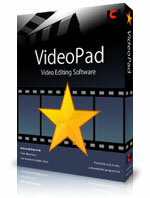 VideoPad Video Editor is a great tool for working with video subtitles. Whether you want to add commentaries to your homemade video, or create professional movie subtitles, VideoPad provides a fun and simple way to do it. You can also load subtitles from existing files and edit them to fit your movie perfectly. Start by downloading VideoPad Video Editor. Follow the instructions in the Setup Wizard to install VideoPad on your computer. When installed, run VideoPad. 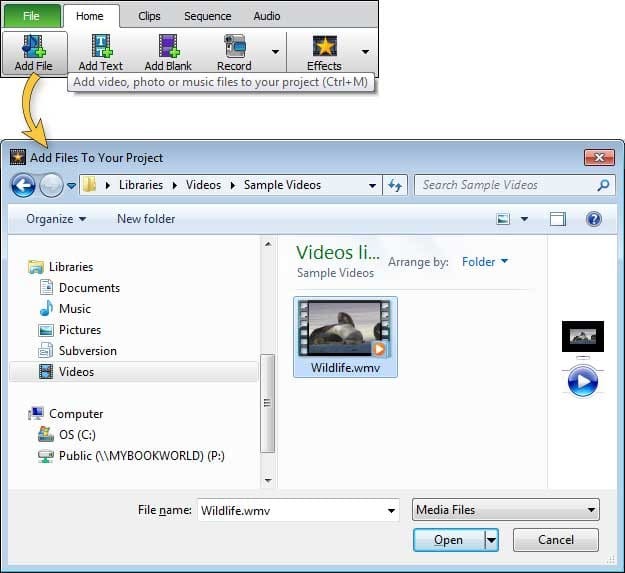 Click the Add File button in the Home tab toolbar to select and load your video file. When your video file is loaded to the project, it will appear in the Video Files bin to the left of the preview panes. Right-click on your file and select "Place on Sequence". You can also press Ctrl+E on your keyboard. Your video will now appear on the sequence. You are ready to start working with subtitles. Click the Subtitles button on the Home tab toolbar. 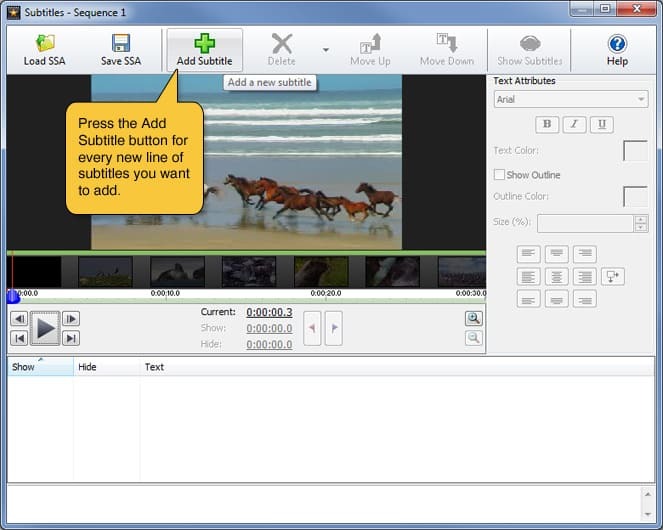 You can either load an existing subtitles file to VideoPad or create your own subtitles from scratch. To import an existing file from your hard drive, click the Load SSA button in the toolbar of the Subtitles dialog. To start creating your own subtitles, place the cursor on the timeline at the right moment in your movie where you want to start displaying subtitles. Then click the Add Subtitle button in the toolbar to create your first subtitles entry. Use the text field at the very bottom of the window to edit your subtitles or input new text. Pay attention to the timing. Every subtitle has "Show" and "Hide" time code. Carefully input the exact time when you want your subtitle to be displayed by clicking on the Show or Hide time link, or drag the red and blue flags and set the show and hide times like you would edit In and Out points on the Clip Preview pane in the main interface. 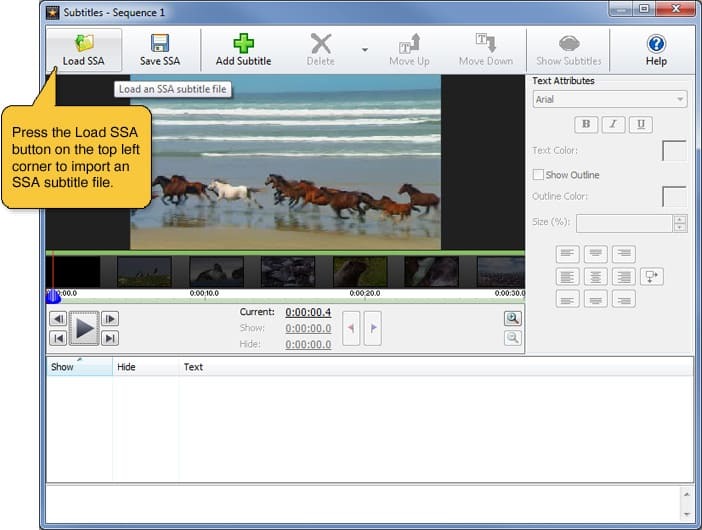 VideoPad offers excellent tools for customization and control over your subtitles. You can change the font, color, size and style of text. You can preview the changes you make in real time, start and pause playback, and jump to certain moments of your video. Subtitles in the list are sorted in order of appearence. You can change that order by clicking the Move Up and Move Down buttons in the toolbar to move the selected subtitle up or down in the list. Note that each subtitle in the list will retain its set duration when moved. Click the Add Subtitle button to insert a new subtitle, or the red Delete button to delete selected subtitle(s). Note the Show Subtitles button in the toolbar of the Subtitles dialog. When it is disabled, your subtitles will be hidden from your clip and will not appear in the final movie, but they will still be a part of your VideoPad project and you can always choose to bring your subtitles back. When you finish working with your subtitles, you may simply close the Subtitles dialog. All the changes you've done to your subtitles will be automatically be saved within your current VideoPad project. If the subtitles are not hidden, they will be displayed on top of your final video when you export it from VideoPad. If you wish to save your subtitles as a separate file instead of permanently merging them with your video, click the Save SSA button in the toolbar of the Subtitles dialog. VideoPad will save them as an SSA file on your hard drive. Note: It is a good idea to give your subtitles file the same name as your video file. Many video players will understand that these files belong together and will automatically load the subtitles next time you play your video. 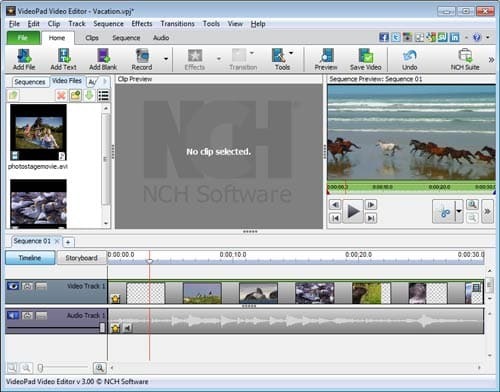 Creating subtitles is one of many brilliant features of VideoPad Video Editing Software. VideoPad is perfect for remastering all the video clips you've been recording on your camcorder. Whether you want to make a video montage of your family's summer road trip, compile a video resume, or assemble the production of your dramatic masterpiece, creating movies has never been easier.